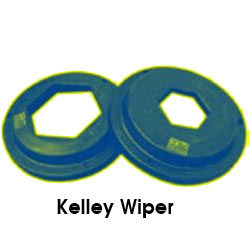 Prominent & Leading Manufacturer from Kolkata, we offer kelley wiper. We are engaged in the manufacture, supply and export of Kelley Wiper. These wipers have been specifically designed for water based and oil based drilling applications. Standard quality rubber has been utilized for manufacturing these wipers. We make these wipers available in several sizes, depending upon the needs of the customers. Offered wipers are made available at standard market prices. Looking for Kelley Wiper ?